Sidewalk Envy: Butterflies Are Free, Wine Tastings Two Bucks! Butterflies Are Free, Wine Tastings Two Bucks! Guess what they have in Ithaca, New York? I tried to Google the question as to how many miles of sidewalks they might have, but no luck. But they are everywhere in town. Sidewalks are in front of all sorts of stores and businesses. We walked on some of them. They lead to music and yarn shops, to arts and craft businesses, to restaurants and pubs, and more. 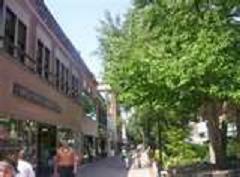 And, there's a lot to do in Ithaca...here's a link below to "Downtown Ithaca." They even talk about their sidewalks! We had decided to do a one night trip out of town this past weekend and chose Ithaca for several reasons. My wife wanted to do some birdwatching with the Cornell Ornithology nature tour leaders (they do weekend morning hikes) and she wanted to take me to Taughannock Falls State Park. We also needed to revisit some of the Finger Lake wineries! I was looking forward to some walking on sidewalks, so I agreed to some off-concrete action! So, one trip was to the State Park. Here's a You Tube shot...not ours...of Taughannock Falls in the winter...the water was pretty much frozen in time this past weekend, but similar in looks to this one, and still a spectacular sight. As I mentioned, we've visited several of the wineries on Cayuga Lake, in the past, but you can never be quite sure if you've tasted everything. Now, I know what you're saying. "There aren't any sidewalks that lead to the wineries!" What I do understand is that there are things we have to accept for the sake of grape art. If I have to get in a car and drive to a winery, so be it. I'll continue to promote "sidewalks for all," with the hopes that someday they'll link the entire lake's wine region with sidewalks, but in the meantime, to keep the industry afloat, I'll make the sacrifice and find my way there any way I can. Any day, any time! There doesn't seem to be enough time in a day to fit in all of the wineries. And then we got a little off plan, which can happen when you're driving from spot-to-spot. The Nature Center has many exhibits, live animals, some hiking paths, and they offer a number of educational programs. They don't seem to grow grapes or make wine, but they did have complimentary hot chocolate the day we were there. Just FYI, as I think it's important for you to know, there are producers out there who do make chocolate wine and chocolate beer. I don't know why they don't offer it at the Nature Center. I would check out nature more often. Wouldn't you? Chocolate is natural, wine is natural, beer is natural, and from the size of the big butterfly sculptures out front of the Nature Center on the main road, you'd think someone there had a few too many. We spotted the two huge winged insects from a distance and wanted to check out the place. Of course, now that we're halfway through the wine tour, we're really interested in seeing just how big the real ones are, need to check out this "Butterfly House," and want to see what else is going on in there! We went through each room in the interior of the center, after paying a small fee, and then headed outdoors, up the hill, towards the Butterfly House. By the way, that same amount of small fee would cover eight wine tastings, at one winery, just up the road. I took some pictures of the "Butterfly House" at the Nature Center and want to point out several things. From a distance, you see the sign on what appears to be a transparent building. As we got closer, we could could plainly see that there were no butterflies in the building at all. In fact, apart from dead plants and weeds and snow, it was pretty much empty. I whipped out my camera and started shooting. My wife asked what I was doing. I told her that, as we seemed to be the only people at the place, I was sure that they were going to blame us for the fact that the butterflies got out. I will also point out at this moment, as you might be asking the question, I was not driving, she was. I took a picture of the door, to prove to the staff in the center that I saw the sign and was sure to close the door behind us! When we got back in the building, we let one of the curators there know that we had made the trip up the hill, saw the exhibit and were sure to follow the instructions on their sign, but had to report that the butterflies were no where to be seen! However, the curator was most appreciative of the fact that we saw the sign and that we had made sure the door was closed! That ensured, she said, that other insects and animals wouldn't get in to make more work for them in the Spring! I wonder how many wineries she had been to that day? We'll be sure to visit there again, maybe before we hit the wine trail next time. I'll be sharing some of our other adventures from this recent trip with you, and a few winery and other area activities, over the next few days. We did make use of the sidewalks!